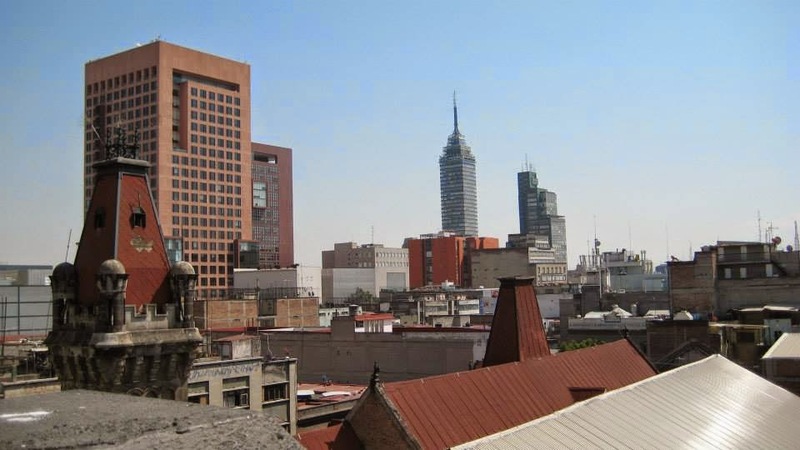 Teaching English in a Foreign Land: Intrepid Den: Mexico City! 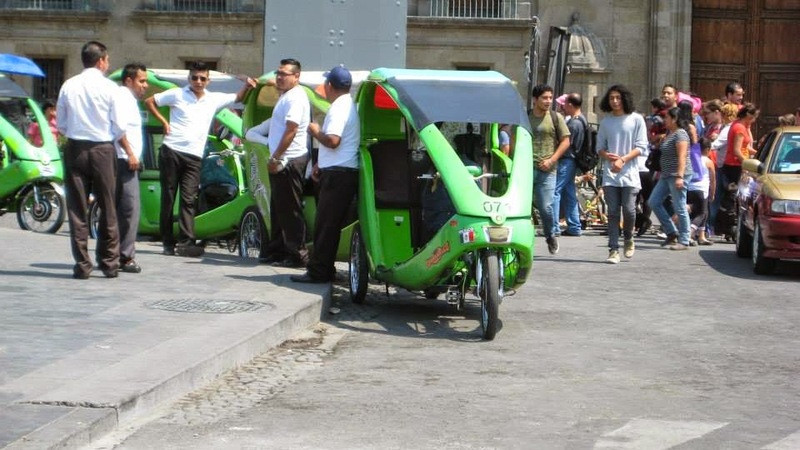 Here's the latest guest post by Intrepid Den in Mexico City. The Massiosare El Hostel, for all it's shabbiness and four flights of stairs, serves breakfast! And I was there, at 9am for really good coffee, pastries, which I shouldn't eat (all those food allergies), and fruit. I got talking to an American man who used to work in “finance” but who has since probably opted out. He told me just how great he thought Mexico was and I agree. Yes, it has it's poverty, but the streets are clean, it feels safe albeit, there are policemen and security guards everywhere – even in the 7/11 stores, the fridge doors holding the beer are kept locked(!) and there are no beggars. So I started walking and I walked and I walked and I walked, heading into town to the Zocola which is the biggest city square apart from Tianamen in China and Red Square in Moscow. The streets are old ones, lined with colonial buildings, some in need of repair and some not. There are tiny shops selling all sorts and street stalls selling everything from nuts and sweets to watches and shirts for that very special occasion. And there are huge great trucks delivering Coca Cola as if it is the greatest thing on earth and here in Mexico, you would think it was. Everyone drinks it. At the centre of the Zocola is the cathedral built to symbolize the importance of Mexico to the Spanish empire – weirdly, it's not that impressive apart from the enormous organ and totally elaborate nave. I know that Mexico city is full of beautiful buildings and history but it is the now, that I find so interesting. 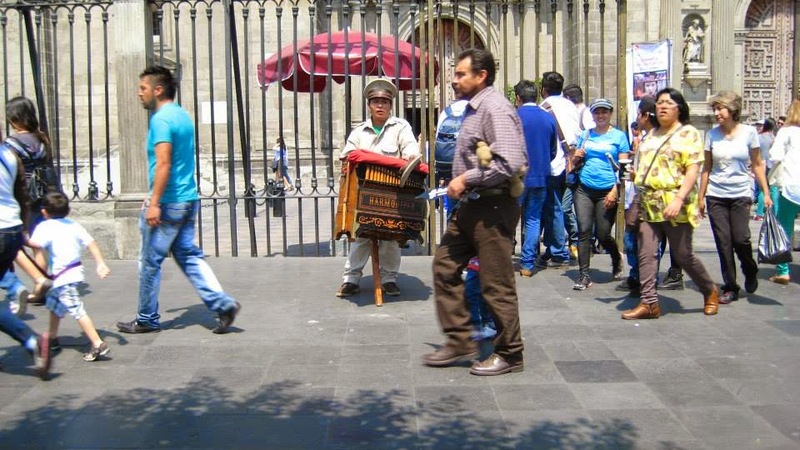 Outside the cathedral, there are uniformed organ grinders who play music with a hand held out for money – is it similar to selling the Big Issue? And there are magazine stalls everywhere – taking a look at the covers, there were several devoted entirely to diabetes. I haven't seen ANY colossal people here yet, even though there is a lot of eating going on but it is all wholesome fair. Well, I say wholesome – there are stalls selling parts of animals that I've never seen before. I presume it's tripe in the nicest possible way but it's all just so haphazard. The stalls are set up everywhere, they cook the food there, they fiddle with the food there, they serve the food there, but nowhere is there any sign of anywhere to wash their hands... Having said that, later on, when I discovered a stall selling rice i.e. a carbohydrate I can eat, with all manner of indistinguishable accompaniments, one of which was meatballs but for the other two dishes I had, I really couldn't say, I sat myself down and ate a bloody great plateful and it was so good, I ate another bloody great plateful and all for £2! But back to Mexico City. There are entire “plazas” - roughly translated as little indoor markets, selling entire religious artifacts where you can buy life size plaster casts of Jesus – Jesus on the donkey on Palm Sunday, Jesus on the Cross, Jesus just being Jesus and many, many, many other saints and Mother Mary's. They refer to “Guadalupe” - I don't know if that is a particularly religious town, but the last time I had anything to do with Jesus, I was under the impression he came from Nazareth but hey, I'm in Mexico and I simply don't care. But I did wonder, are people buying these enormous ornaments for their houses or for their churches? I suspect that it is for personal use which takes religion to a whole new dimension. In Mexico City, there are also museums everywhere. I went into one displaying photographs, taken in the 80's and it looked like the Mexico I expected – old fashioned, with “peasants” at play and the simple pleasure they exuded at fiesta time. It's still here but it's now – one girl's t shirt said “I am addicted to my smart phone” - apparently she's not the only one. And then I came across Plaza Santo Domingo where there are stalls not selling food, but words. Scribes sit here, with all sorts of paper and cards, to write a message for you – perhaps to a loved one or an official, and by their sides, are men playing games of dice and chess. There just seems to be an abundance (there's that word again) of time and peace where no one is in a particular hurry and life is for living. Yes, there is a whiff of sewers now and again, but not as bad as Venice and the lack of sophistication is to be applauded. Wandering off onto the Republic of Cuba (there is a street dedicated to just about every Latin American revolution), I came across an entire street dedicated to wedding dresses. And you should see them! They would make a Gypsy wedding seem bland and then there are the other shops where you would dress your bridesmaids and then the other shops where you would buy your trousseau. They take marriage very seriously I presume and why not? And then almost finally, there was the government building of Education which hadn't always been dedicated to education, but was now and it is simply splendid. It dates from the 1920's and the revolution when Mexico threw out it's capitalist rulers and the peasants took over. Education was seen to be the most important asset anyone could have, so where else to set itself up, than in the grounds of an old colonial building. The walls are painted with the murals of Diego Rivera which depict the revolution. I walked up to the entrance and with my my no Spanish was confronted by someone asking me something – this is a government building after all, with metal detectors not dissimilar to an airport. I was ready to give up when a lady approached and said “Do you want to see our murals?” “Yes!” I replied. And that was all it took. With art, no words are needed. I saw the whole of the Mexican revolution – and it is still going on. And that is what is so great about Mexico. They keep saying no! I'd have photos to show you but, not for the first time, my camera has packed up. Luckily, I am assured, it is only the memory card – why I didn't I think to buy myself a new one – how many pictures am I going to take! And so back to my hostel and you know what? I wouldn't rather be anywhere else. I sat in the communal room which has good wi fi, I could leave my lap top unattended, ask the really helpful (and also unfeasibly good looking but in a Mexican way) owners questions which they were so proud to answer for me, and once I'd swapped the outside light bulb for the one in my room, which gave less light than a candle, I am now sitting in my tiny BRIGHT room wondering what sights and sensibilities tomorrow will bring. Breakfast again but today there was an English couple. The man is jet black with hair that stands up in trowel shaped dreads – god knows what Mexico makes of him, and his girlfriend. He's a cycle courier and she teaches kids to cycle. We talked to the American man from yesterday, the only difference being that they get my jokes and he doesn't – I love our sense of humour and the fact that we are always so ready to laugh. Not unlike the plug adaptor scenario in Oaxaca, today I was on a mission to get a new memory card for my camera. Simple you would think, but no. After walking for an hour to recommended shops, I finally found a proper photographic shop and I was back in business except I still couldn't get it to do anything so just asked a man with a huge camera draped around his neck if he could sort it out. Seconds later, problem solved, I asked him how he'd done it – the “function” button apparently. You'd never guess I'd studied photography for a year. So once again I sallied forth and this being Saturday, you can forget everything I said about Mexico City yesterday. It was total CHAOS! Everyone must come to town and with something like 30 million people in the city, that's a lot of people. Cars clogged the streets, people clogged the pavements and street vendors clogged every open space. It's hard to believe what's on sale – if you can imagine it, it's there. One old lady, skin of leather and varicose veins that look like a relief map of the Sierra Madre was just sitting there selling nail clippers whilst other people sold knickers, socks, trusses (!) bags, plastic bubble blowing guns and god knows what. They just set up stalls anywhere they can and they literally, line every street. Most museums in the city are free and I just wandered from one to another – having worked in the Natural History Museum, they don't hold the same allure, but in the Cultural Museum of Mexico I was totally discombobulated. One of the exhibitions showed the ancient pyramids and their people and I thought crikey, they are exactly like the ancient civilizations of Egypt! Turned out that they were the ancient civilizations of Egypt – I was in the equivalent of the British Museum except that they didn't plunder the world for their exhibits, they simply borrow them. But apart from all the weird goods for sale, are the sheer number of food outlets, from the stalls, to the cafes, to the restaurants – you can get anything you want and a lot of what you don't want. Mexicans seem to eat all day – a little and often. I finally found a patisserie with cakes to shame Paris which also sold my favourite – rotisserie chicken. I went in, I sat down and I ate, but was more interested in the devotion they pay to cake. They must have been a grandmother and grand daughter who took at least five minutes to choose their cakes which were the shape of wagon wheels and not dissimilar in size, stuffed with fruit and cream and the look on their faces as they sat down to eat was one of bliss – had it been in Paris, they would have been too aloof to even acknowledge joy, but this is Mexico and passion is everywhere. Heading home for the day, I just let myself drift with the crowd. I took my bearings from the sun and roamed streets full of performers much like on the South Bank or Covent Garden – how do those people seem to levitate? There is entertainment everywhere from break dancers to the Mariachi bands replete with sombreros and buckled boots. At one point, I stopped for a cigarette and as a policeman, dressed from neck to foot in very hot clothes approached me, I thought, “Don't tell me he's going to tell me I can't smoke” (like in the utterly polluted city of Agra, home to the Taj Mahal) but no, he just asked me for a light! I should say, that today, there were policemen and women everywhere and just in case – well, it is Mexico, racks and racks of riot shields. I'm not sure if they were expecting something in particular or anything in general. Anyway, as I left the centre, I walked back through the “electric district” and it is just so magical. Nothing is thrown away here and everything is recycled. There are tiny shops the size of my shed which refurbish motors and everything else you can think of and there are electrical goods for sale that we in the “West” (not forgetting that Mexico is in the west) would be ashamed of taking to the dump – like microwave ovens with bits missing. Do they still work without a door? Maybe, but stand well clear when operating.... And just to prove that things will carry on working long past any apparent sell by date – you should see the buses. I doubt any of them would pass an MOT, they list to either side, they are all bashed up from crashes, they belch smoke, they are loaded down with people hanging out of the doors and yes, they are laughably cheap but, curiously, not as cheap as the metro which is just 5 pesos a ride which can take you from one end of Mexico City to another – that is 12p! I love this city! My last day in Mexico and I had two options, spend all day in the Museum of Anthropology which every one raves about, or go out and have a day doing what Mexicans do. What choice did I have? I asked Gus, the totally cool dude who runs the place where I should go. To Coyoacan, he said. So first, I went to the artisans market nearby and what a place! If I didn't have to lug stuff around with me, I would have bought one of everything and my house would very quickly look like a bright and beautiful Mexican cantina. They had everything, from little pottery skulls (they are everywhere), to superb silver studded sombreros, puppets, purses, bags, jewellery, shawls, ponchos, hammocks, carpets, wall hangings, tablecloths, glass, the odd religious memorabilia, old ladies asleep at their stalls and even a man making guitars and cellos! I shouldn't really have bought anything but I really did need a new bag, purse and ring – I got them all and barely a barter in sight. I even bought a little picture – I asked how much? He said something which of course I didn't understand – I thought he said 400 i.e. £20 but what he actually said was 40 i.e. £2. What could I do – he even threw in a couple of bookmarks gratis. And so I wandered into the “tube” built by the French and exactly like the metro except without any colour – it is purely functional but what do you expect for 12p a ride? Incidentally, it cost the same to have a pee as it does to ride the subway – that one I simply can't make out. I went nine stops south and with my trusty Rough Guide map, got completely lost. At one point, I was walking in totally the wrong direction and a young girl ran up to me and asked me where I was going – obviously there was absolutely NOTHING in the direction I was going. I told her Coyoacin, she turned me around, and off I went again – and they tell you Mexico is a dangerous place! As you approach, it is as if all roads lead there and everyone is walking in one direction. Suddenly, the road leads into a square with restaurants, bars, churrio stalls (like long doughnuts), coffee shops, ice cream parlours, taco bars, yet another indoor market (I daren't look too hard in case I found things I liked more) and yes, a rotisserie chicken shop. I intended to sit in a restaurant and have a proper meal but with my non-existent Spanish I just didn't know what I might end up with - tripe in cheese or something equally indigestible. Even the chicken joint was a challenge – I was trying to ask for a quarter. In the end, he asked me, in perfect English, if I spoke English! They didn't do quarters, he said, they did halves so with no other option, I came away with half a chicken, rice, salsa sauce and he even threw in a spoon and all for 50 pesos - £2.50. I sat on a bench next to a young couple and watched many other young couples, sharing an ice cream, walking, talking and it was such a joy. This is what Mexicans do. They enjoy themselves. There is no pomp, no ceremony, no rules, no nothing. They just get on and enjoy themselves. There are bands playing, there are people dancing, street performers and there is shade everywhere from the huge trees that surround the square. On of these trees – you can even see it from the plane as you fly in, has huge purple flowers and I have no idea what it is, but it is so beautiful. There is such a simplicity of life in this country. They dress up, they promenade, they fall in love, they have kids, they have grand kids and life just goes on. It doesn't make me wonder who's got it right – I already know. And as the sun began to set, I wandered back towards my hostel and came across another Sunday soiree but as I ventured in, I realised straight away that this wasn't a jolly civilised affair. It seemed to be where the homeless and derelict assembled. I was eyed with amazement, interest and curiosity, but not in a good way – I felt like the intruder that I was. There are areas like this all over the world and Mexico is no exception. I got the message and went home, climbed the four flights of stairs for the last time, finally got my extra blanket from Gus and arranged for a taxi to take me out of here tomorrow. Adios Mexico, Hola Columbia!! !